Due to the new General Data Protection Regulation (GDPR), which I’m sure you’ve already heard about, I’m writing this post to let you know about changes I am making to my privacy notice and the way I keep in touch with you. As a subscriber of my blog on Michelle Coveney Fitness, you don’t need to do anything more and I’ll continue to send you an email each time a new post is published. If you would prefer not to receive an email each time I publish a post then you can unsubscribe from my blog by clicking on the link at the bottom of this email. To celebrate World Mental Health Day on 10th October, England Athletics encouraged many groups like ours to hold a #runandtalk session in order to improve mental well-being through running and to break down the stigma associated with mental health by getting people talking about it. So on Wednesday 12th October, instead of our usual coached running session, we all headed out for a social group run and enjoyed the chance to chat whilst we ran. Furthermore we all donated our weekly training fee to the mental health charity ‘Mind’. Thanks to the generosity of the runners in the group we raised a fantastic amount of £55! As runners we all appreciate how running benefits our mental health – running offers us all the chance to switch-off from the pressures of everyday life, enjoy a relaxed chat without distractions, or sound-off to our running buddies and get a problem off our chest. Added to that running in the fresh air, especially through beautiful countryside, is very therapeutic as it helps us to feel more connected to nature. And at the end of a run we all feel so much better as our bodies release those feel good endorphins! If you would like to improve your mental well-being through running and would like to join us or want some help to get started, then please get in touch. 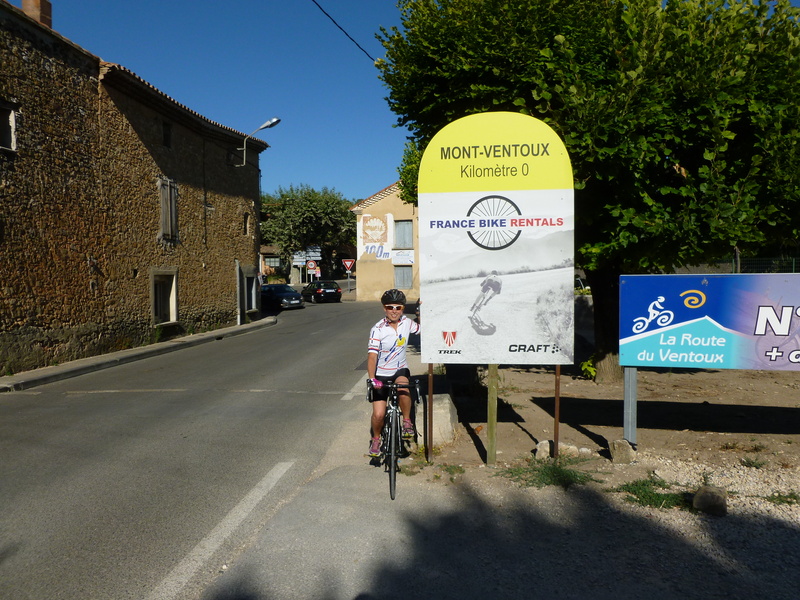 During a family holiday to the south of France, my husband and I grabbed the opportunity to achieve a long held ambition to cycle up Mont Ventoux – the most feared climb in the Tour de France. We knew that this would be a huge challenge for us both; as the last time we had done anything like this was 20 years ago when we were both much younger, very active cyclists. In recent years neither of us had done much cycling so we were not quite sure what we would be letting ourselves in for; and we would be relying entirely upon our fitness gained from running to get us through the challenge. We had booked some bikes to hire from Bedoin and planned that my husband would ride up Mont Ventoux first (with me following in the car for support with drinks and snacks), then the next day we would swap roles and it would be my turn to ride. My big day dawned on Wednesday 24th August. I woke up early having had a restless night and feeling a sense of dread at my impending cycle ride up Mont Ventoux. Having seen how tough it was the day before I wasn’t sure how I was going to fare. It was a sunny day and it was already a warm 24 degrees Celsius even though it was only 9am. As I arrived at the cycle hire shop in Bedoin and collected my bike for the day – a Trek Emonda S4 – I was feeling incredibly nervous. After a few adjustments and a short test ride I was ready to set off. I lined up by the starting sign and posed for a photo and then I was on my way. The first few miles were relatively easy and I rode them gently in an attempt to save energy for the tougher, latter stages of the ride; although my pace was slower than I could run! At 2 miles I took my first stop and topped up my fluid and energy levels, and it was pointed out to me that I was already riding in my lowest gear and the steep climb was yet to come. I set off again and soon turned a sharp left hand bend and suddenly the climb became a lot steeper. I stopped again after another 2 miles and was feeling fine until I got off the bike. Going from riding with my heart rate in the low 170’s bpm to suddenly standing still made me feel somewhat giddy and a bit sick. I waited for my heart rate to recover and feeling better I hopped back on the bike and away I went. Throughout the steep wooded section I continued to stop every mile or so to allow myself a chance to recover whilst I topped myself up with fluids and jelly babies. I found with each 5 minute stop I felt a lot better and could resume my cycling feeling a bit recovered. Despite the gradient the wooded section was not as bad as I had feared. I found some parts easier than others and I tried to keep a rhythm going and just focused on completing one mile at a time. I was really pleased to reach the 6 mile mark feeling in good shape as I was a good way into the ride and was making solid progress. I had even started to enjoy it! All around me there were other cyclists on their own personal quest to conquer Ventoux, plus there were lots of cars following cyclists all providing support – it felt like our very own stage of the Tour de France! I was amazed when I reached the Chalet Reynaud as I knew I was just 6 km from the summit – I couldn’t believe I had made it this far already and I was still feeling in good shape. I ate the last of my Chia Charge bar, then said goodbye to my family ready for the final push to the summit. I rode the next 2 km quite well as the gradient was a bit easier. I was now entering the bleak peak of Mont Ventoux with its lunar landscape. I took a quick short stop and then pressed on again. It was now getting much tougher as my legs were growing tired and the high altitude meant my body was having to work harder. The last 3 km seemed to go on forever. I found myself taking more frequent stops and all around me other cyclists were struggling too. With 3/4 of a kilometre to go I saw my family by the roadside and stopped again – I didn’t think the final kilometre would ever finish and to make matters worse the gradient was now 11%. I could see the 500m marker in the distance so I just focused on that. Next I set my sights on the next corner where the car park and sign for the restaurant came into view – I was so nearly there. I kept myself going and turned the last corner to the finish line (which was cruelly the steepest corner of all) and then I reached the finish line. I couldn’t believe I had made it and didn’t have to do anymore climbing. I had ridden uphill for 21.5 km to an altitude of 1912 m. I took at selfie and then waited to be reunited with my family. I then posed for more photos by the summit sign and sat down in the shade to ate my packed lunch. After half an hours rest I bought myself a souvenir mini replica of a road-side marker showing the distance, altitude and gradient of the climb, and then I began my descent. The descent was amazing and I couldn’t believe how fast I descended – I thought I would go at a snail’s pace as I am not great on descents. I just used my brakes when I needed to scrub off a bit of speed and enjoyed the sound and sensation of the wind whooshing past my ears. After spending all morning getting up the mountain, it only took me 35 minutes to descend, and I was struck at the sudden rise in temperature as I returned to the valley below – it had now risen to 35 degrees Celsius. Before I knew it I was back in Bedoin where I returned my bike to the bike hire centre – my journey was over! I felt really pleased with how I had ridden – it was tough, but I hadn’t really suffered or struggled too much and I had thoroughly enjoyed the experience. It had truly been a test of determination and I had to dig deep to find my inner strength, but I’m glad to say my mission was accomplished and I had ticked off one of the items on my bucket list. This Monday (11th July) will be the last session of our current 8 week programme. We will then have a break for one week and return on Monday 25th July with a series of special summer sessions throughout the rest of July and August. Each week the circuit session will focus on a particular target area: legs, bums, t ums or high intensity cardio. And to get you in the summer mood the exercises will be performed to fab summer party music – just want you need to get your body ready for the beach! So what are you waiting for?….Come along, workout and have some summer fun…. A new regular 8 week programme will return to circuits in late September. Sadly most runners are side-lined at some time or another by injury and accepting that you are injured and not able to run can be really tough, but it is really important to take the correct course of action to help recovery and prevent re-occurrence of the injury. All injuries fall into one of 2 types: acute (an injury that happens suddenly and is very painful and makes any movement nearly impossible) and chronic (injuries that start as a niggle and gradually get worse over time – these are typically ‘overuse’ injuries). Sometime it is possible to continue training with a chronic injury that is detected early, provided that training load is reduced and preventative/corrective exercises are undertaken, but in many cases an injury does mean a break from running. So, if you are injured what should you do to get back onto the road to recovery? Firstly, take some painkillers such as paracetamol to help ease the pain (but not ibuprofen for the first 48 hours as it is thought that it can interfere with the body’s own healing mechanism). Also reduce inflammation/swelling by elevating and resting the affected area and apply ice for 10 minutes, 3- 5 times a day for the first 3 days. It is a good idea to monitor your pain level by using a rating system such as the one below. This wil l give you an idea how your recovery is progressing and when you resume training will help you assess whether your injury is coming back. If an acute injury does not improve within 3 days (or a chronic injury with 2 weeks) after following the above advice then please seek medical or expert help. After 48 hours you can start taking anti-inflammatories, eg. Ibuprofen and 3 days into the injury alternate applying heat and ice to the injured site. The heat will increase blood flow which will encourage the absorption of the swelling, removal of debris and dead blood cells, and the formation of new blood capillaries and scar tissue. After this a programme of gentle mobility, stretching and strengthening exercises should follow to help with the healing. To maintain fitness during this phase you may want to do some cross-training; walking, cycling and swimming are great options (provided they do not cause any pain) – or if you can manage it try some aqua-jogging. Once you are pain free then you can start running again. However DO NOT resume the same training regime as before you became injured – you will need to build up slowly to prevent a reoccurrence of the injury. Regardless of your running ability your first ‘run’ should be just 10 minutes of alternating 1 minute running with 1 minute walking. This way, if your body is not ready to resume training you won’t do too much damage. If following this short ‘run’ you are pain free, then 48 hours later try the same again, but this time for 20 minutes. Provided you are still pain free, run again 48 hours later – this time running for 1-2-3-3-5-5-5 minutes with 1 minute walking breaks in between. Continue running every other day gradually increasing the running intervals and reducing the walking breaks until you are back to covering your normal training distance. If at any time you feel discomfort, a niggle or pain then rest up and when pain free revert back to a previous stage of your running recovery programme. Once you are back to running your normal distance then introduce some fartlek sessions for a few weeks before trying any speed work. If all goes well then you can resume full training and enjoy running again! If having read this article you feel you need some further help or advice with getting back to running following an injury then please do get in touch.